Cleaning out your tackle box and shopping for fishing equipment is an annual spring time tradition here in New England. From deep, cold water lakes with Lake Trout, Pike and Salmon, to beautiful speckled brook trout; bass filled ponds and saltwater fishing for Mackerel, Tuna, and Blues – New England is famous for fishing vacations. A New England Fishing Vacation can include luxury accommodations at Waybury Inn in Vermont or even a private vacation home with all the amenities at Lopstick Cabins in Pittsburg. We can help you pick the ideal fishing lodge or luxury cabin getaway complete with an Orvis professional fishing guide. To inquire about New England fishing destinations or to feature your business, contact us. Discover the best fishing and fishing vacation lodging in Vermont. We found local fishing spots on Lake Champlain, in the deep lakes of the Northeast Kingdom and on the famous trout-filled Battenkill River or near a famous historic inn. Find more Vermont fishing from VT LIVING.com. Located at the foot of the Green Mountains with outstanding fly fishing streams and rivers nearby, the Waybury Inn is an ideal location for your Vermont vacation. Ask us about area fishing guides that are available to assist you in finding out where the hot fishing spots are or provide you with personalized fly fishing lessons. The Waybury Inn has offered comfortable lodging, unpretentious fine dining since the 1800's. Fishing in New Hampshire is a favorite way to pass the time. With all the lakes and beautiful scenery, it is no wonder. There are great places to fish throughout New Hampshire. No matter where you are, or plan to be, there is great fishing not far away! The “Big Lake” – Lake Winnipesaukee holds giant “Lakers” – Lake Trout, Landlocked Salmon, Perch and other species. The majestic Connecticut Lakes Region in Pittsburg is top rated destination for flyfishing and harbors “Brookies”, Rainbow Trout and Salmon. The headwaters of the Connecticut River are among the most productive trout fishing waters in New England. 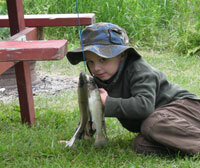 The NH fishing information is organized by region in the New Hampshire Fishing Guide. Located in New Hampshire's Connecticut Lakes Region, we offer cozy, housekeeping cabins on First Connecticut Lake, Back Lake and on the River. Cabins have fully equipped kitchen, one, two and three bedrooms, satellite TV, outdoor grills in the summer and private porches with great views. Fishing, hunting, snowmobiling on New England's BEST trail system. Moose watching on "Moose Alley", and birding are favorite activities. We offer Orvis products, motor boat, kayak and canoe rentals as well as snowmobile rentals in the winter. Take a Maine Fishing Vacation. There are over 3,000 lakes and ponds equaling 32,000 miles of fish filled water – and that’s just inland Maine. Whether you’re an amateur or a pro, Maine has the fishing spots that will appeal to you. Discover the best locations to catch “the big one” in Maine by region, with links to other area attractions, restaurants, lodging, and a wide range of Maine indoor and outdoor activity information. The Maine Fishing Guide in ME Living will tell you about unique Maine fishing vacations. Whether it’s the thrill of deep sea fishing for shark or bass off the coast of Cape Cod, or the serenity of fly fishing at one of the Berkshires’ many stunning rivers, the Massachusetts fishing guide will help you find the perfect fishing hot spot for a day of relaxation or a destination fishing vacation. The Massachusetts Fishing Guide in MA Living will lead you to additional Bay State Fishing fun. Diversity makes for Great Fishing in Connecticut! Trout, walleye, pike, catfish, striped bass, bluefish, scup, largemouth bass, smallmouth bass, blackfish, fluke, … the list goes on and on. If you’re looking for great fishing in the Northeast then Connecticut is the place to be. Avid anglers will love the challenge of matching wits with wily trout in our TMAs, the sophistication of competitive bass fishing, or night fishing for huge striped bass in Long Island Sound, the tranquility of our trout parks, or the simple fun of fishing for scup off a jetty or pier. Whatever your fishing pleasure, you’re sure to find it in Connecticut. The Connecticut Fishing Guide in CT Living will offers ideas for Connecticut fisherman and women. Don’t let the size of this tiny state fool you. With countless marinas and coastal launches, there are some fabulous fishing spots throughout the Ocean State. Discover the best locations to catch the ‘big one’ in RI. Whether you are into saltwater fishing, freshwater fishing or fly fishing, Rhode Island has a spot for you to drop your line in the water. Browse the different Rhode Island Fishing to find a fishing spot near you. In New England fishing is a year-round outdoor activity. Ice fishing gives way to springtime trout and salmon runs. The time of year when the weather fluctuations and temperature changes are signaling the arrival of spring. In the northeast Spring means recreational fishing! Early Spring, before the waters warm, is the best time of the year to fish for Lake Trout and Landlocked Salmon. The silvery salmon are quite active and are feeding near the surface in early spring. First Connecticut Lake, Second Connecticut Lake, Lake Winnipesaukee, Newfound Lake, and Lake Francis are popular NH Fishing Destinations.